This article was originally published in Southern Brew News. 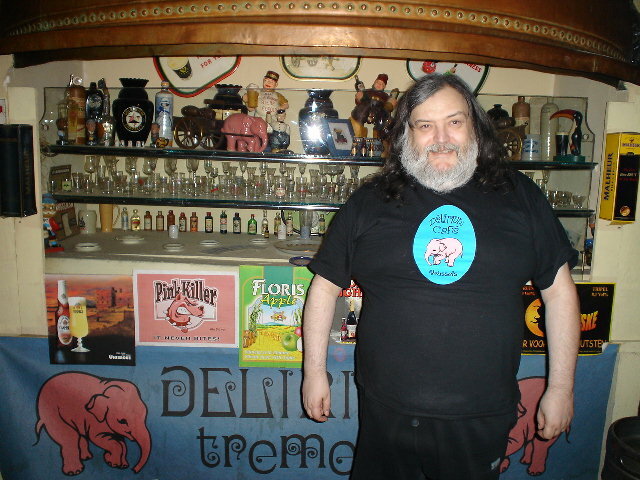 I have been lured to Belgium on many occasions by the astounding array of unique and flavorful beers available there. Belgium has more beer styles than any other country on Earth, and Belgian ales are mysterious, extraordinary, diverse and delicious. There are Trappist ales made in monasteries, beers with fruit and spices, fruity pale ales, strong golden and dark ales with candy sugar, sour brown ales fermented in wooden vessels, Lambics fermented only with microbes from the air, and many others. I journeyed to Belgium last July for a week of beer exploration across the tiny country. This article is an overview of some of my travel notes that outline the magical beer spots visited and a few of the remarkable beers tasted. It’s a short (but difficult) drive from the Brussels airport to the beautiful Grand Place square at the city center. Brussels is filled with medieval roads that run in various confusing directions, so park your car downtown and walk from place to place. The city’s best new specialty beer bar has to be the Delirium Café (4A Impasse de la Fidelite) that boasts more than 2000 different beers from almost 60 different countries. Colorful old wooden beer barrels form the tables in this delightful cellar pub near the Grand Place. Delirium owner, Joel Pecheur, is a dedicated beer lover who has created a café that is also a beer monument complete with hundreds of beer signs and posters, nostalgic glasses and trays, and a beer list the size of a small phone book. Opposite the front door of Delirium Café is the Jeanneke Pis statue that is a female version of Manneken Pis (a small sculpture of a urinating boy that is a symbol of Brussels). No beer lover should miss Brussels’ Cantillon Brewery (56 Rue Gheude, Anderlecht) that produces outstanding examples of spontaneously fermented Lambics. These ales have no additions of cultured yeasts and rely on the microbes that reside in the atmosphere around Brussels and in the wooden fermenting barrels to change the wort into beer. Lambics are usually golden ales that contain only 3-6% alcohol by volume (abv) and are made with a portion of unmalted wheat. Cantillon was founded in 1900 and is now a working museum of brewing - for a small entrance fee visitors can take the self-guided brewery tour and enjoy samples of the earthy, sour, intense Lambics. Old Lambic blended with young is called Gueuze, and there are fruit versions with cherries (Kriek) and raspberries (Framboise). 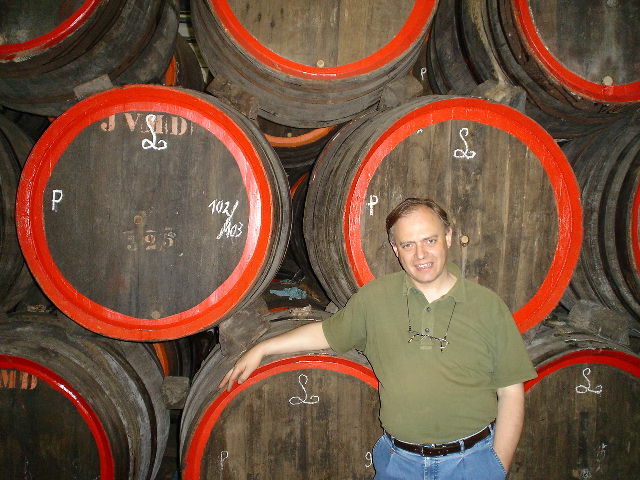 Jean-Pierre Van Roy married a daughter of the Cantillon founder and took over brewing responsibilities in 1978. By refusing to take shortcuts such as pasteurizing or sweetening his products for the mass market, John-Pierre has become known as a true Lambic traditionalist and inspiration for other brewers. After a magnificent day of pub crawling in the center of Brussels (see the list of pubs at the bottom), day two found me driving out to the more rural, Lambic producing suburbs of Brussels known as Payottenland. My first stop was the Lindemans Brewery (1479 Lenniksebaan) in the small town of Vlezenbeek. 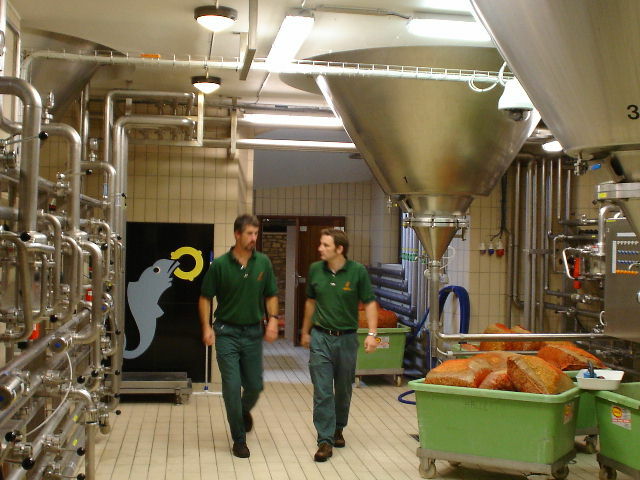 Lindemans is famous for production of popular, non-traditional fruit Lambics that are pasteurized and sweetened. Their sweet, dessert-like Framboise is the biggest seller in the states, and a more acidic version of an apple Lambic is on the way in early 2006. Dirk Lindeman, who is the nephew of the owner Renee Lindeman, greeted me at the brewery and gave a tour of the pint-size, rustic old brewery and the grand new brewery that was installed in 1992. It took seven years to gain permission to build the new brewery because the original facility was started on a farm, and the surrounding area had to be rezoned from agricultural to industrial. Lindemans (like all Lambic brewers) only brews in the cooler months of the year (September to April) to avoid the disruptive wild yeasts of summer that can give the beer off-flavors. However, summer is busy with bottling, kegging and blending. Lindemans has a dozen employees and a production of 3.5 million liters. Next stop was the interesting De Cam lambic blending facility (67A Dorpsstraat) located in the De Cam Museum of the town of Gooik. Started in 1997 by a professional brewer from another company, De Cam attempts to create unique, flavorful and traditional Lambics by blending select ales from other Lambic breweries in the region. The manager’s brain is filled with Lambic trivia. For example, I learned that some of the unmalted wheat used to make a Lambic produces liquid that goes into the brew kettle with raw, unconverted starch. This starch is slowly digested over many weeks/months by unusual (but necessary) microbes (like Brettanomyces wild yeast) that ferment the brew in later stages. There is also a friendly café in the museum where visitors are able to purchase the beers and dine on hearty Flemish cuisine. The best dinner in all of Payottenland can be had at the Drie Fonteinen Lambic brewery café (2A Hoogstraat) at the center of the quaint town of Beersel just south of Brussels. Brothers Armand and Guido Debelder run a Lambic brewery and blending operation along with a fine restaurant that serves all their noteworthy beers with many elegant dishes prepared with beer. The excellent bottled Drie Fonteinen Lambics are available at the café to take home as well. Day Three. In the morning I force myself out of bed and into the shower to recover from my Lambic-induced haze and hit the road to the southeast of Belgium for a visit to the Brewery of the Abbey Notre-Dame at Orval (6823 Villers-devant-Orval, Florenville). This Trappist monastery produces one dark golden, dry, spicy ale that exhibits noticeable hoppy, earthy, mineral-like complexity. The term “Trappist” is shorthand for a Catholic religious order, the Cistercians of the Strict Observance. 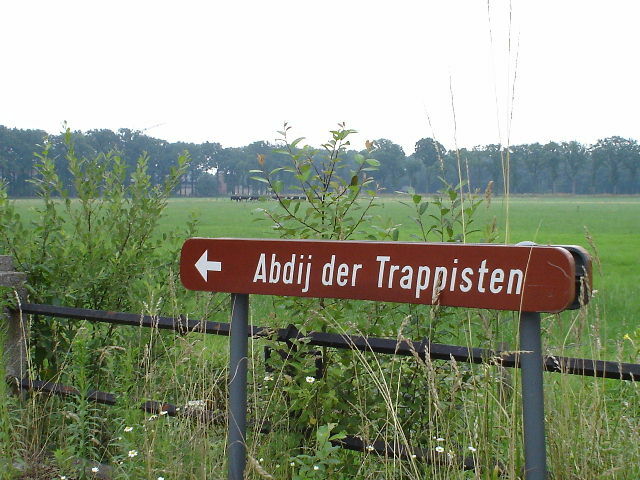 Only beers made within the walls of a Trappist abbey by (or under the direction of) the monks may print the “Trappist” appellation on the label. A portion of the proceeds from the sale of the beer must also benefit charity. Orval’s Trappist ale is made from pale malt, light caramel malt, hop extract, hop pellets and liquid candy sugar. The brewery’s general manager is Brother Xavier, and the other employees are brewing professionals. Dry hopping is done in huge sacks (like giant tea bags) with Hallertau hops, and the beer has a bit of yeast and sugar added to the bottle to produce natural carbonation. The Orval label artwork shows a fish with a ring in its mouth. A legend says that around 1076 a princess dropped her wedding ring in a gushing spring and prayed to the Virgin Mary for its return. After a small trout came to the surface and returned the ring to the princess, she called the area “aurea vallis” (Orval – golden valley) and decreed that an abbey would be built there. 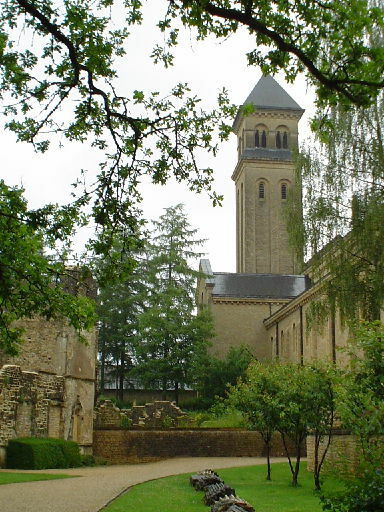 Orval has a visitor’s center with walking access to the ruins of the old abbey. There is also a gift shop where visitors may buy Orval beer, glasses and the cheese made by the monks. The Ange Gardien brewery café on the main drive to the abbey offers tasty food, Orval beer and the monk’s table version of Orval that is lighter in flavor and alcohol. 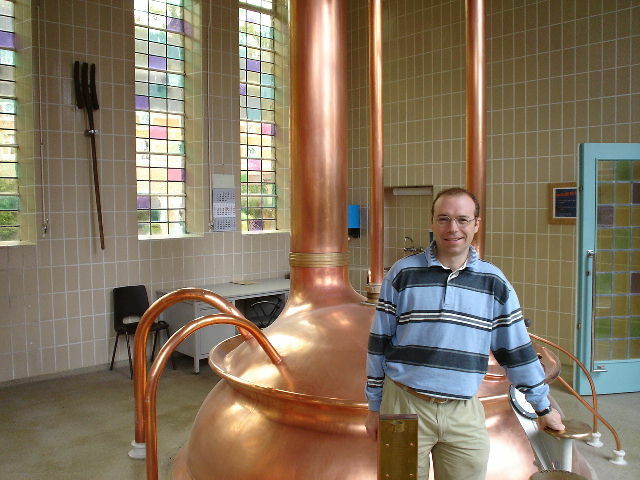 Visits to the actual brewery are restricted to persons with connections to the brewing industry. About a one hour drive north of Orval is the town of Rochefort. This is the location of the Rochefort Trappist Brewery at the Abbey Notre Dame St. Remy (8 Rue de l’Abbaye). Their Rochefort 8 is a beer of around 9% abv, and the same beer made stronger with more ingredients is Rochefort 10 at 11% abv. These ales are rich and flavorful with notes of dark fruit, chocolate, dark candy sugar, alcohol and spices (although they contain no spices). As with most Trappist breweries, Rochefort is cloistered (closed to the public), but I was able to gain permission to visit the abbey from Rochefort brewery engineer Gumer Santos. Gumer is not a monk but he has a deep appreciation for the lifestyle and philosophy of the Trappist way of life. He introduced me to the monastery’s Father Abbott who makes all the decisions for the brewery. Father Abbott has been at the abbey for 24 years and told me, “Monks have been making beer for centuries, and we have that tradition to uphold. The recipes and yeasts may change a bit over time but the feeling for the beer and the brewing way of life is the same. 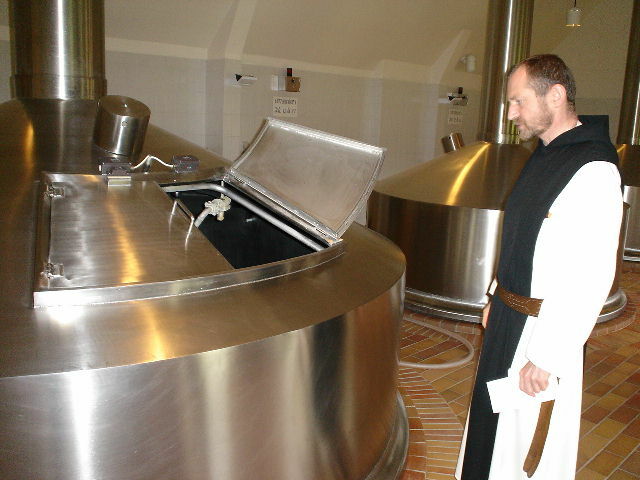 Our first task as monks is not to produce beer but to search for closeness to God. Work in the brewery is part of our full spiritual life.” The brothers spend 6-7 hours in church each day and use the proceeds from the brewery to support the abbey and local charities. The Abbott also told me that the laypeople who work in the brewery receive the spirit of the monastic way of life and have a wonderful working relationship with the brothers. The Father Abbott was also the person who designed Rochefort’s attractive new goblet shaped glass. The abbey does not have a café, but there are many enjoyable bars and restaurants in the town of Rochefort in which to sample the abbey’s beers. Rochefort’s brewery only works to about one half of its capacity because the abbey feels that this is sufficient. Brewing begins most days at 3:30 AM when Gumer Santos says “there is a magical atmosphere at the brewery with the sunrise coming through the stained glass windows.” Gumer trained as a technical brewing engineer for almost 12 years but has no computer in the brewery – everything is done by hand with a personal touch. After primary and secondary fermentation the beer is centrifuged and placed in bottles with sugar and more of the original yeast for refermentation in the bottle. The bottles are warm-conditioned for two weeks to allow for carbonation and then shipped out. The new importer to the USA is Seattle’s Merchant du Vin who imports around 4000 cases total for a year. Near Rochefort, in the small hamlet of Falmignoul, I made my way to the microbrewery called Caracole (86 Cote Marie-Therese). Known for the cartoonish mollusks on their labels, Caracole produces flavorful ales that include a spiced wheat beer, amber ale, strong golden ale, and strong brown ale. Casual visitors are welcome in the summer months for frequent tours and sampling. On my fourth day I was off toward the northern area of Belgium near Antwerp to Westmalle – home of the Trappist brewery of the Abbey of Our Beloved Lady of the Sacred Heart. Westmalle is the largest of the Trappist beer producers and maintains a huge commercial plant at the abbey that is overseen by monks and completely run by brewing professionals and laypersons. Westmalle produces a Dubbel (brown in color with a caramely, spicy flavor and 7% abv) and a world-class Tripel (golden with 9.5% abv and a deep malty, peppery, citrus fruit character). Pure groundwater from the abbey, French malts, yeast, hops (Czech, Russian and German) and candy sugar are the only ingredients used to make the fine brews. Mini-brews are done each year with the new malt and hop crop for taste testing and consistency. 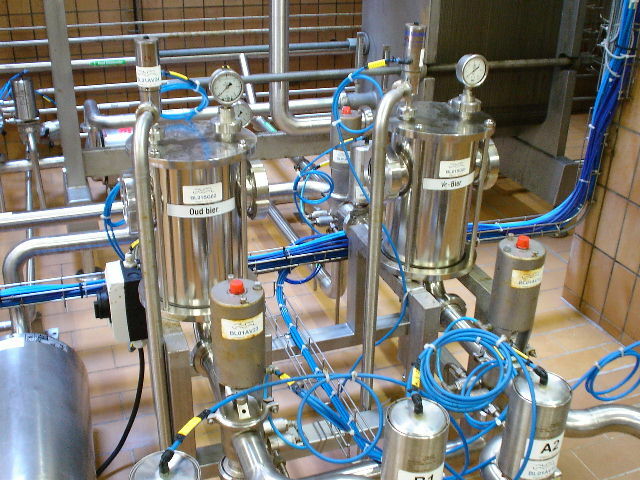 120,000 hectoliters are produced each year, and a new state-of-the-art bottling line was installed in 2001. One technician is in charge of Westmalle’s large yeast propagation facility. Unpasteurized Dubbel is sent to a very small kegging room with added yeast to carbonate in the kegs – the Tripel is no longer kegged. Also, a mild blonde ale called “Extra” is produced twice a year for limited release and consumption by the monks. The abbey has existed for 200 years, and the monks have given up much of the labor of the brewery to maintain their quiet, contemplative life that is dictated by the Rule of Saint Benedict (the founder of modern monasticism). The board of directors is made up entirely of the 22 Westmalle brothers (52 to 92 in age) who take thoughtful time in making every brewery decision - the website even took two years to work out. The monks have cows and make their own cheese (brewery spent grains fed to the cows give the cheese a sweet flavor) which is only available for sale at the abbey and the Trappisten café across the street. The attractive Trappisten café also serves lunch, dinner and the Westmalle beers. The evening after my visit to Westmalle was spent touring the best beer bars in the center of Antwerp (see list at bottom of this page). The highlight of my following day in Antwerp was a visit to the city brewery De Koninck (291 Mechelsesteenweg). 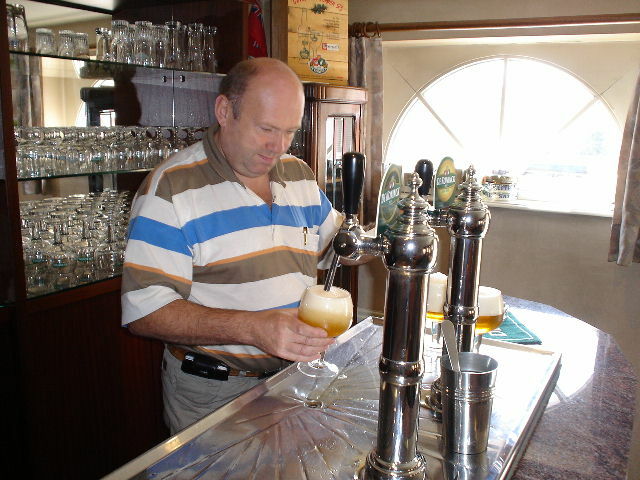 Started in 1833 by the De Koninck family, the brewery was purchased in 1919 by the Van Den Bogaert family and is now being run by Dominique Van Den Bogaert, the grandson of the purchaser. De Koninck produces the world’s most authentic and drinkable Belgian Pale Ale (5% abv) that is available unpasteurized on draft all over Antwerp. If you order a “bolleke” at any pub in the city, you will receive a goblet of De Koninck pale ale; this beer accounts for 90% of the brewery’s production. The copper colored ale is similar to an English Pale Ale but is more aromatic in malt and fruity fermentation notes. Other special brews are produced including De Koninck Blonde at 6% abv, an 8% abv Tripel and a Winter Koninck at 6.5%. The brewery sits on land that housed the Pleasant Garden Pub in 1827 that faced a city park where criminals were hanged in public executions. Following the gruesome entertainment, the onlookers went to the pub for a beer. De Koninck is a compact city brewery with two floors and good use of limited space. Dominique said “The brewery produces a large quantity of beer per square inch. Being on a city block, the brewery has limited space but De Koninck is associated with Antwerp and we take pride in being in the city.” The old brewhouse (now a museum) was retired in 1995 and a new, much more modern facility took over next door. 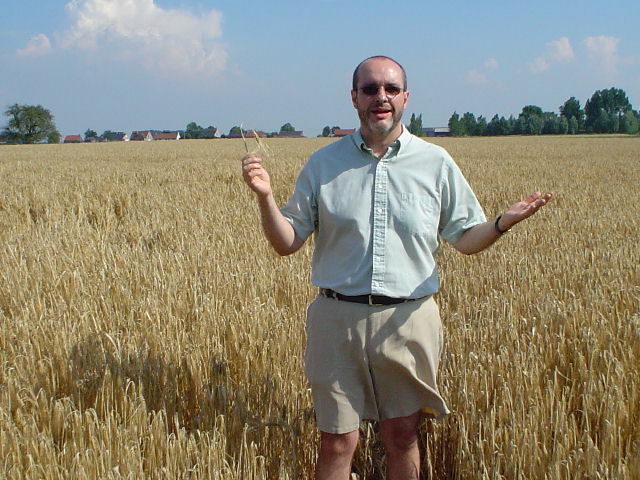 Day five led me west from Antwerp to the small brewers’ town of Watou in West Flanders. There is a statue near the center of town that pays tribute to Belgian brewers, and Brewery Van Eecke (2 Douvieweg) fills the role of local brewery quite nicely. Van Eecke churns out a line of excellent bottle-conditioned beers including Kapittel Pater brown ale, Kapittel Dubbel, Kapittel Prior Strong Dark Ale, Kapittel Abt Tripel and the golden, refreshing, yet hoppy and complex Hommelbier. Brewery tours are available on Tuesday, Wednesday, and Saturday. Next door to the brewery the café In Het Brouwershof serves the full range of the Van Eecke beers. Across the town square from Van Eecke in Watou sits the amazing Hommelhof restaurant (17 Watouplein). Watou is in the middle of the hop growing region of Belgium. Hommelhof actually means “hop court” in Flemish, and this café specializes in scrumptious food prepared with Belgian beers. 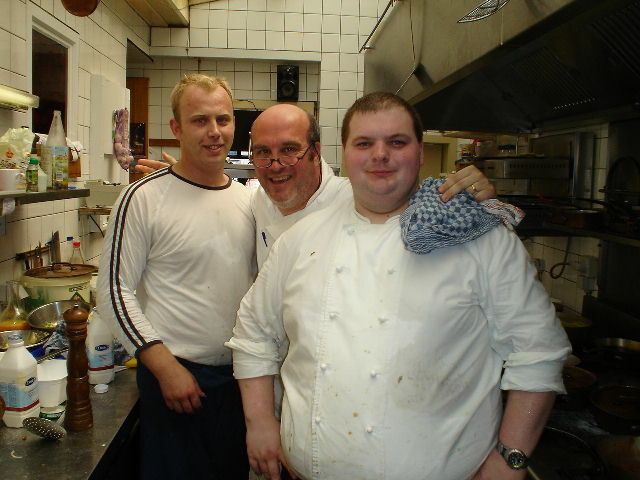 Chef/owner Stefaan Couttenye recommends the section of the menu called “Het land van Amen” where each course is cooked with and served with a beer. Examples include tomatoes and caviar with Rodenbach red ale, sole with mushrooms and Hommelbier, veal with coriander and St. Bernardus ale, and Flemish biertarts with Kriek Lambic. There are 30 or so good beers on the menu, but even don’t think of coming here to drink without eating – it would be such a waste. Day six. I drove down a diminutive road (more like a paved cow path) from Watou to Westvleteren to check in to the delightful Pahilleke bed and breakfast run by my friends Patrick and Hilde Gouwy-Hauspie. There is a walking path behind the B&B that leads to the Saint Sixtus Trappist Abbey that is the location of the Westvleteren brewery (12 Donkerstraat). The three admirable beers that are produced here include a Blond ale (a spicy pale ale at 6% abv), Westvleteren 8 (a brown Dubbel-type ale at 8% with hints of raisins, licorice, and cocoa) and Westvleteren 12 (a 10.2% Belgian Strong Dark Ale with remarkable layers of dark fruit, chocolate, and spice notes). 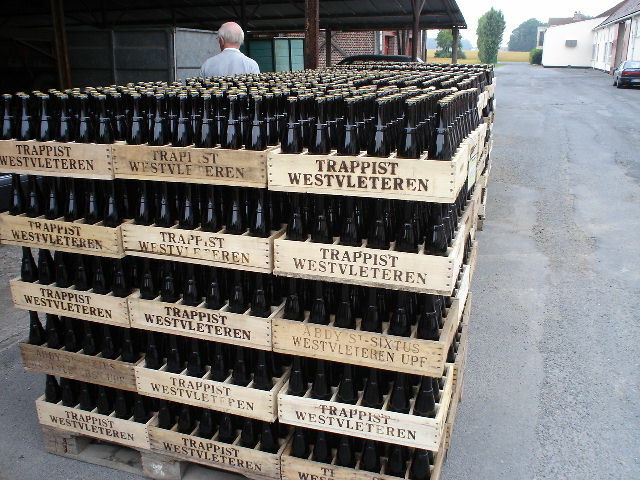 The Westvleteren beers are produced in very small quantities are are only available for sale at the small drive-up sales window of the abbey and at the Vrede café across the street. There is a limit of five cases of beer per vehicle, and everyone who purchases the beer agrees not to resell it. The beers have no labels – only the color-coded bottle caps have printed information. 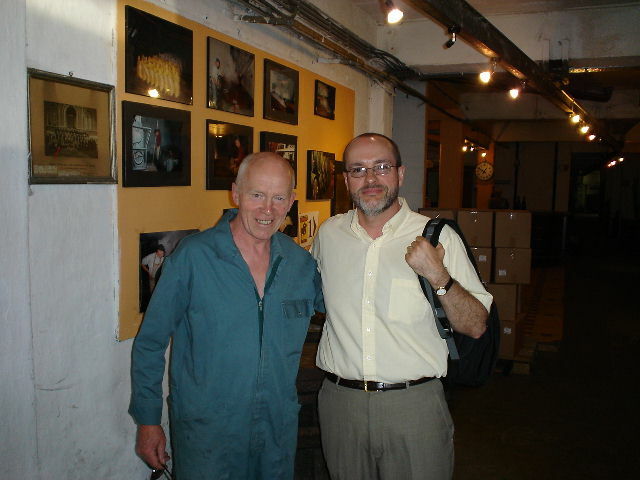 I was invited for a rare visit to the abbey to interview Brother Joris who is in charge of the brewery. He was quick to express to me his concern over the Westvleteren beers being resold in America by persons who are shipping them over and adding their own labels. Joris told me “We decided in the 1950s to have a small brewery and limit production so we can do most of the work.” Unlike other Trappist breweries, Westvleteren only employs three workers who are not members of the abbey. The brothers want their beers to be available in the area of West Flanders for local, private consumption. Persons buying the beers for resale in other areas cause the products to sell out too quickly at the abbey. Joris says “We brew to live, but don’t live to brew. We want to be a local brewery and produce enough beer to support ourselves and our endeavors – and no more. We need time for our spiritual lives.” The annual production of 60,000 crates (each wooden crate holds 24 bottles) a year is done in 75 days by five of the 27 members of the monastery. The bottling line dates from 1978, runs only 35 days a year and can fill 12,000 bottles an hour. The monks have no desire to increase production, and they admit that rarity and exclusivity of their beers contribute to a mystical aura. The Westvleteren beers are produced in open fermenters and contain water, malts, sugar, and hop pellets and hop extract only. There are no spices in the beer, and Joris says “the specific list of malts and ingredients in the 8 and 12 is classified.” The 8 and 12 are different strength versions of the same recipe. There are two brew kettles at St. Sixtus abbey, and the stronger first running of a mash can go into one kettle to become the 12 while the weaker, later mash liquid goes to the second kettle to make the 8. Westvleteren’s yeast comes from Westmalle, and a brewery worker drives to Westmalle to pick up fresh yeast for each batch. The same yeast is used to ferment the ales and bottle condition the beers. Candy sugar is used in the 8 and the 12 to boost complexity and alcohol, but there is no sugar added to the Blond. 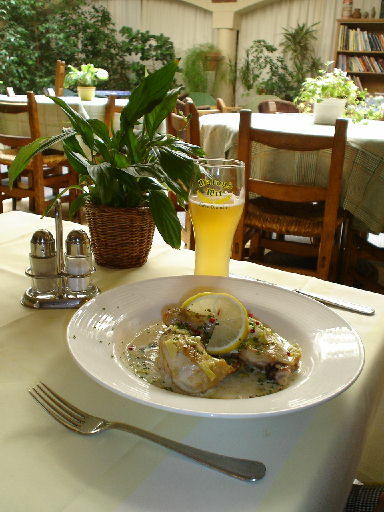 Monks are allowed to drink the Blond beer with their meals (which are vegetarian). Westvleteren is the smallest and most private of all the Trappist breweries, but across the street from the abbey is the not-to-be-missed In De Vrede (“In the Peace”) café that welcomes the public. A much larger café with outside patios replaced its tiny roadside predecessor in 1999 and was built a few more meters away from the abbey to help accommodate the crowd of visitors and keep the noise away from the monks. The café is owned by the abbey and leased to a manager. The small menu consists only of soup, cheese, cheese sandwiches and the three marvelous Westvleteren beers. The cheese comes from French abbeys just over the border. 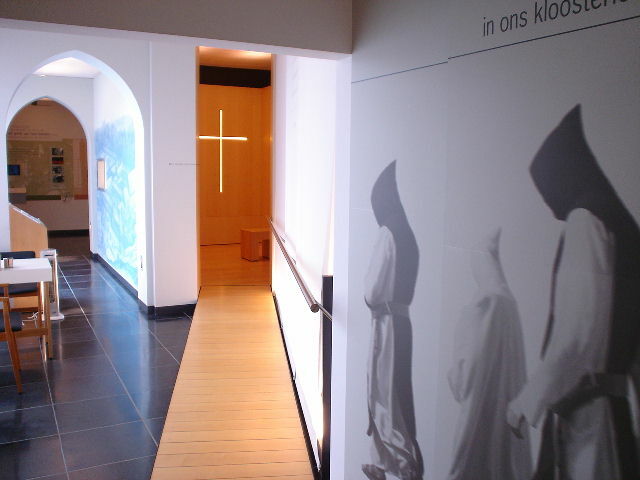 There is a gift shop selling the Westvleteren beers and other souvenirs of the area, and De Vrede also has a multi-media museum (The Claustrum) with displays (mostly in Dutch) that explain the philosophy, lives, and history of the monks of St. Sixtus abbey. The Claustrum is only open from 2-5 PM and closed on Fridays. Driving from Westvleteren back to Brussels on the seventh day of my Belgian experience took me to the busy town of Roeselare. 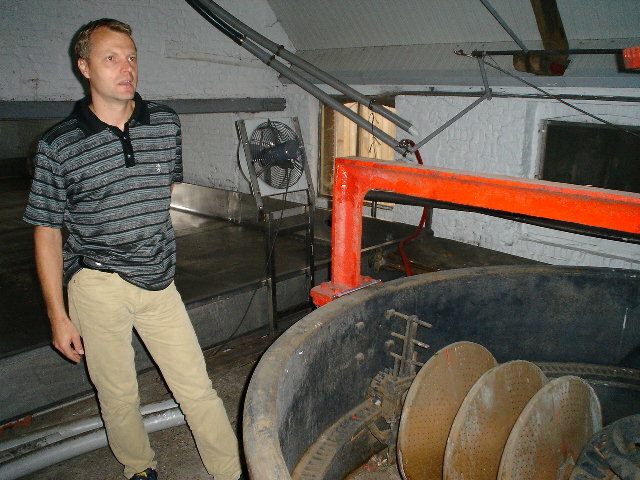 I had phoned ahead to visit the Rodenbach brewery (133 Spanjestraat), and brewery manager Rudi Ghequire showed me around the old, unused brewery that dates from 1836 and also the sparkling, new, highly automated brewery that was put into operation in 2004. Amazingly enough, both breweries were designed and built by the same company 168 years apart! Rodenbach has been absent from the U.S. market for the past few years due to its purchase by Palm Breweries in 1998 and the switchover to the new brewing facility. Rudi told me that Ommegang in New York is now importing the Rodenbach beers into America, and this fall we should see the classic Rodenbach and the Grand Cru back on shelves here. Both these beers start with a low alcohol, lightly hopped red ale that is primarily fermented in stainless steel tanks and then transferred to old, impressive, closed-top wooden vats where the beer takes on a luscious vinous, sour, fruity character after two years. 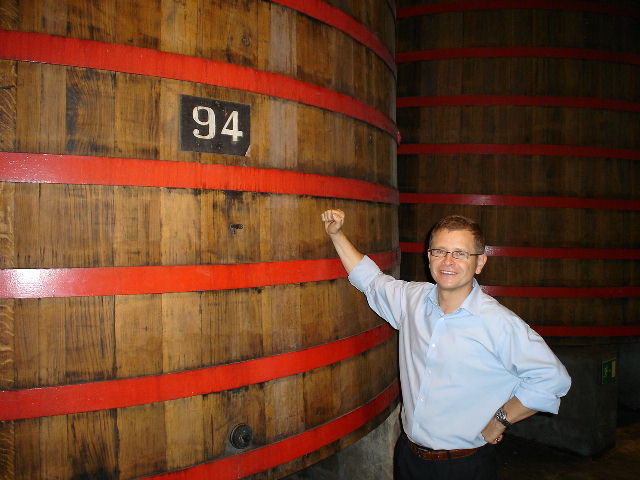 Rodenbach employs a “mixed” fermentation of ale yeast with wild yeasts and bacteria that reside in the wood. Beers from several of the wooden vats are blended for consistency, and this complex ale is either bottled as Grand Cru or added to the young red ale to make the regular Rodenbach. The company is also bringing forth RedBach - a new beer with a big addition of cherry juice for an intense, but well-balanced fruit flavor. My thoughts on Day 8 on the plane to Atlanta: It’s easy to see why Belgian ales fascinate me. But sales of these ancient and unique beers are on the decline, and bland pilsners and lager beers hold the majority of the beer market in Belgium. I hope that everyone who reads this will one day fall in love with the great beers of Belgium, spread the love to friends and make a trip to Belgium to experience these wonderful beverages that deserve to be appreciated and preserved. TIP: No beer lover should head to Belgium without a copy of CAMRA’s Good Beer Guide to Belgium written by Tim Webb. Bier Circus, 57 Rue de l’Enseignement – Beloved beer bar with a huge selection. A bit of a walk from the Grand Place but worth it. La Becasse, 11 Rue Tabora – Timmerman’s Lambic café with tasty bread, soft cheese and radish appetizer. Brasseurs, 24 Rue de la Colline (Grand Place) – Big brewpub with mild house beers including a lager, English ale, Wit, cherry beer, dark ale and a bottled Tripel. Fish, steak, chicken and various desserts. Delerium Café, 4A Impasse de la Fidelite. 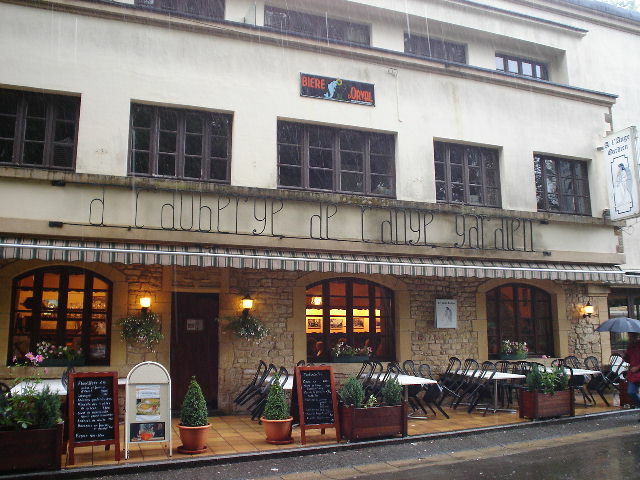 La Villette, 3 Rue de Vieux Marche aux Grains – Tiny restaurant that spills out into the big street plaza out front. Cuisine made with beer. Mort Subite, 7 Rue Montagnes aux Herbes Potageres – Gorgeous 1920s café with mass-market, sweet Mort Subite Lambics. Paon Royal, 6 Rue du Vieux Marche aux Grains. Poechenellekelder, 5 Rue du Chene – Puppet-filled pub near the famous Manneken Pis statue. La Rose Blanche, 11 Grand Place – The “White Rose” is a friendly restaurant that overlooks the Grand Place. Try the fixed price, three course beer dinner. Spinnekopke, 1 Place du Jardin aux Fleurs – The “Little Spider” has Cantillon Lambics for an aperitif and superb beer cuisine (even desserts made with beer). Toone, 6 Impasse Schuddevelde – Near the Toone Puppet Theater. Zageman, 116 Rue de Laeken – Personable old bar with fine Lambic and Gueuze. Berenbak, 17 Minderbroedersstraat - Small pub next to the school of fine arts. Den Engel, Brabo Square Antwerp Centrum – Oldest and most popular pub for a De Koninck ale. 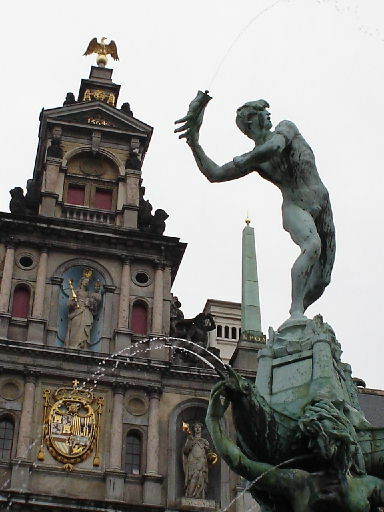 Overlooks the famous Brabo “hand-thrower” statue and fountain. Groote Witte Arend, 18 Reyndersstraat – Courtyard bar with some good Lambics. Highlander, 2 Pieter van Hobokenstraat – Scottish pub with a variety of beers and single malts. Kulminator, 32 Vleminckveld – Best beer selection in Antwerp that even includes vintage ales from previous years. Oud Arsenaal, 4 Maria Pijpelincxstraat - After a beer here go across the street to the Horta restaurant for great food. Pakhuis, 76 Vlaamse Kaai – Take a taxi down to this warehouse brewpub. Try the Blonde ale with soup, the Antwerp Brown with an entrée and the “Scary” Tripel with the ice cream beer dessert. Waagstuk, 20 Stadswaag – Beautiful old café with respectable beer list.